Since the 13th of April 2016, the Mundaneum is officially one of the 29 European Heritage Label sites chosen by the European Commission. This first Belgian site joins prestigious cultural institutions such as the Abbey of Cluny, the house of Robert Schuman, or the Peace Palace in The Hague. This selection sees the combination of two projects, the project of European integration that the label promotes, and the project of the founders of Mundaneum, Paul Otlet and Henri La Fontaine. Two projects born from the same ideal: peace through culture! The founders of Mundaneum, Henri La Fontaine (Nobel Peace Prize 1913) and Paul Otlet, took part in the intellectuals and political discussions of their age, about peace across Europe, representation, human rights, economy and trade. The content of the collections (Press Museum, Universal Repertory of Documentation, International Institute of Photography, Collective Library of the Learned Societies, collection of posters and postcards) naturally extends to all of Europe. This network of individuals and institutions contributed to the exchange and opening of new partnerships for intercultural dialogue, based on national or regional diversity. The Mundaneum thus symbolizes peace through culture in Europe. After Mons 2015, the European dynamic continues at the Mundaneum with the European Heritage Label. Already part of Unesco’s Memory of the World register, this new acknowledgement underlines once more the important role the Mundaneum plays in today’s Europe both as an archives centre and as a crossroad between heritage and digital questions. What is the European Heritage Label ? 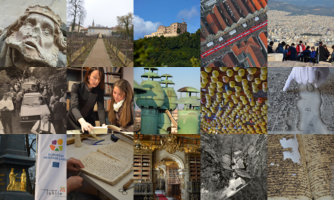 The European Heritage Label sites are milestones in the creation of today's Europe. They celebrate and symbolize European integration, ideals, values and history. They are carefully selected for their symbolic value, the role they have played in European history and the activities they offer to bring the European Union and its citizens closer together. In a certified European Heritage Label site, there are always a thousand things to see and do; visitors can find a range of exciting activities and educational devices. What makes the European Heritage label unique and how is it different from the UNESCO World Heritage List? European Heritage sites bring to life the European narrative and the history behind it. They are about much more than just aesthetics. The focus is on the promotion of the European dimension of the sites and providing access to them. This includes organising a wide range of educational activities, especially for young people. European Heritage sites can be enjoyed singly or as part of a network. Visitors can get a real feel for the breadth and scale of what Europe has to offer and what it has achieved. To learn more about the 29 EHL sites, visit Creative Europe.